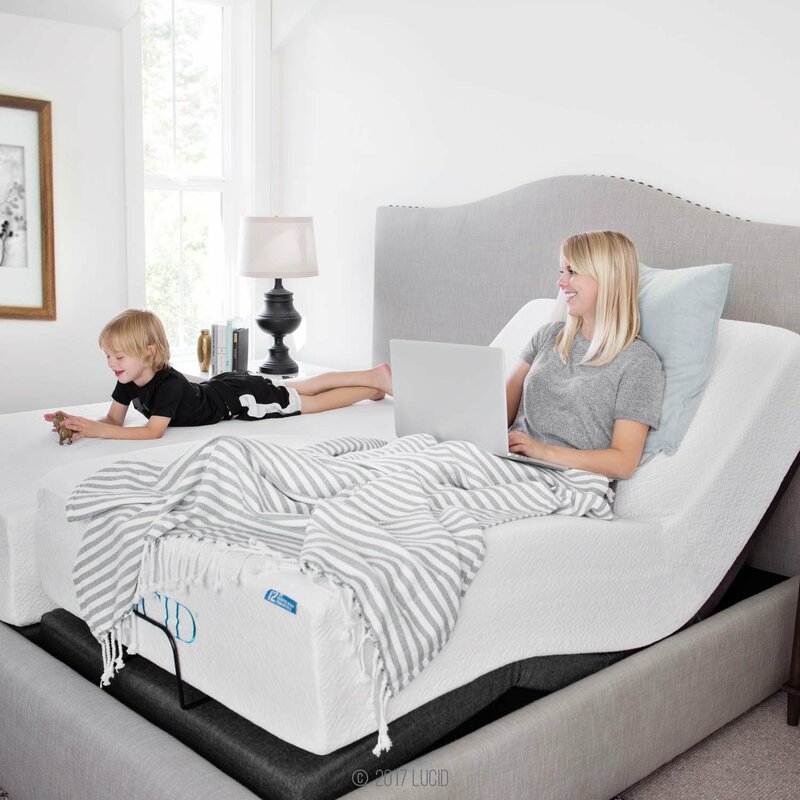 Lucid, renowned brand name in mattresses segment, has now venture into adjustable beds as well. 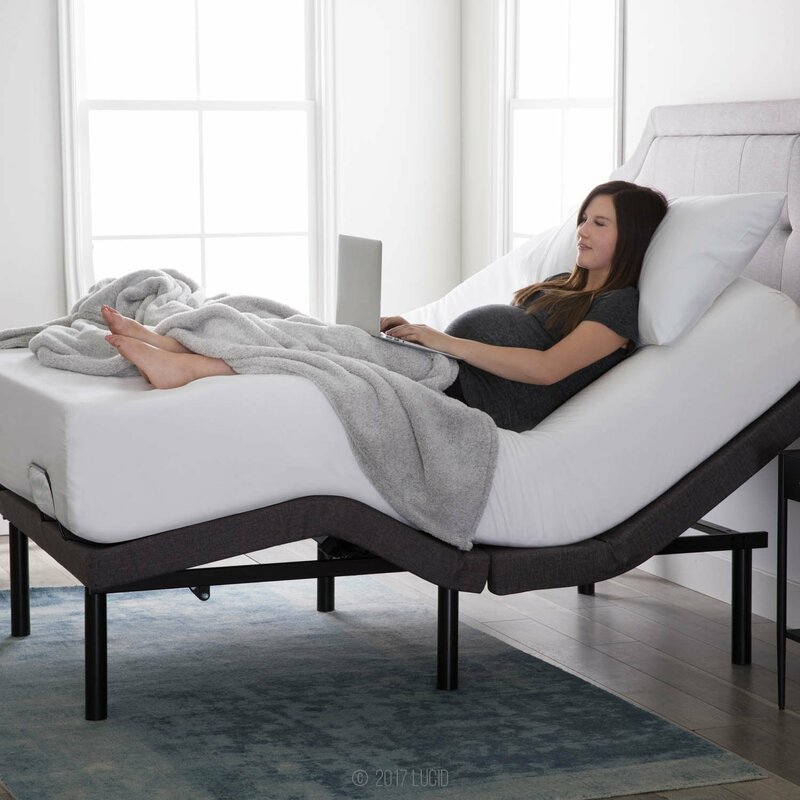 Just like it’s mattresses, even its adjustable bed Lucid L300 is super affordable and the fastest plus highest selling adjustable bed in the market today. Although it doesn’t include high-end features of a premium adjustable bed, but at this price it has pretty much every requisite basic feature. You will be surprised to know that the price of this bed is less than that of a 14 inch premium mattress. That’s what is Lucid is famous for, offering best features at low prices. However, if you are looking for massage feature as well then this is not the bed for you as it is the only feature that is not included with this bed. If you are ready to compromise on massage functionality and only focus on health related benefits then there is no other bed at this price. Lucid is the only best available option. But if you want massage functionality as well and ready to spend a bit more then iDealBed or Ghostbed adjustable beds are the best options. 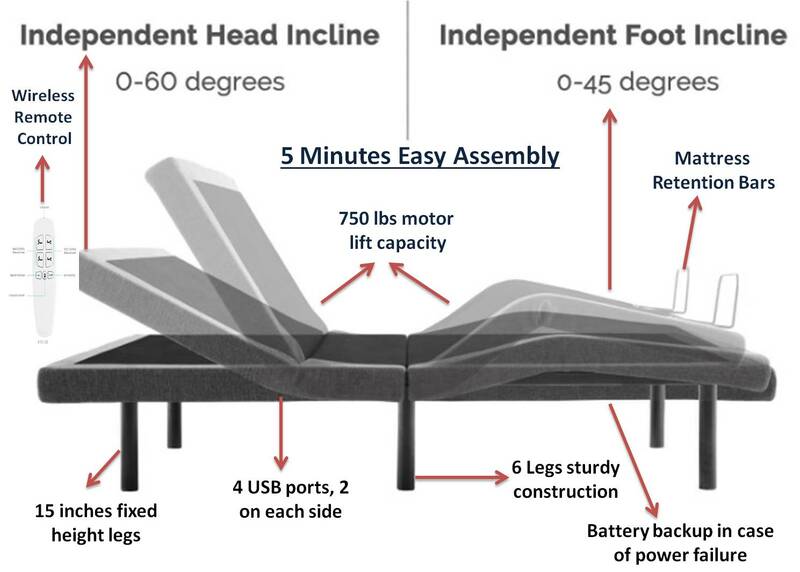 60 degrees of head section adjustment and 45 degrees of foot section adjustment means that Lucid adjustable bed offers pretty much all types of positions from watching TV, working on laptop and zero gravity. Apart from FLAT position, the remaining ones are not included as preset positions, you have to do them manually. But the remote does offer one memory savable positions, which means you can tune to your favourite angle and save it on your remote. Adjusting the head section to 30 degrees will help open up air valves and works as an anti-snore position. With head section at either 45 degrees or 60 degrees you can comfortably work on your laptop, watch TV or enjoy a lounging position. And head section at either 30 degrees or 45 degrees and foot section lifted slightly upwards, you can enjoy zero-gravity position to relax and rejuvenate your body and muscles after a hectic day. While most other leading brands in low end basic adjustable beds category offer absolutely no memory savable positions, Lucid L300 offers one memory savable position. 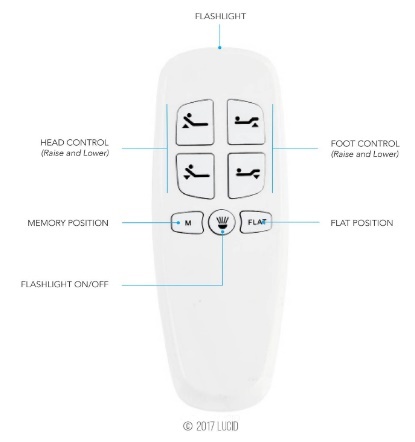 You can simply save your favourite position (as M1) and tune into the same as and when needed by simply pressing the same M1 button on the wireless remote control and the bed automatically lifts both the head and foot sections to your favourite angles. Lucid adjustable bed’s wireless remote control comes with a simple intuitive user interface as depicted in the image below. Offering total of 4 USB ports is in fact a feature on par with high end adjustable beds like Leggett & Platt’s Prodigy 2.0 and Reverie 8Q. While most adjustable beds in low end category do not offer even a single USB port in first place, Lucid L300 offering 4 USB ports, 2 on each side of the bed is perhaps a definite unique selling point that places Lucid far ahead of other brands and makes it a preferred choice in low end segment. 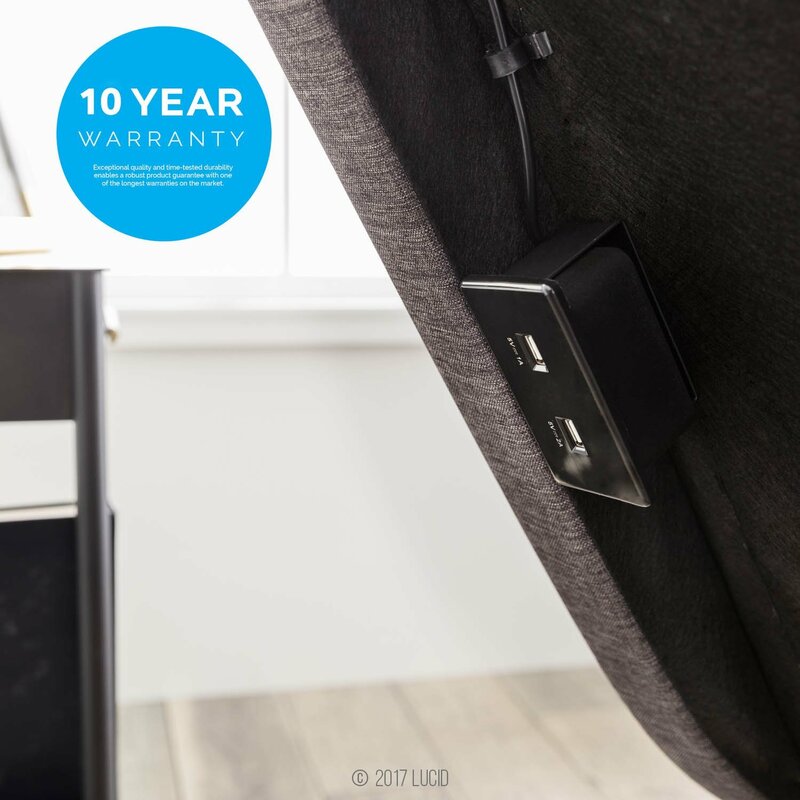 Lucid being the latest brand to venture into adjustable beds, perhaps, has surely scored above its contemporaries by offering USB 4 ports. 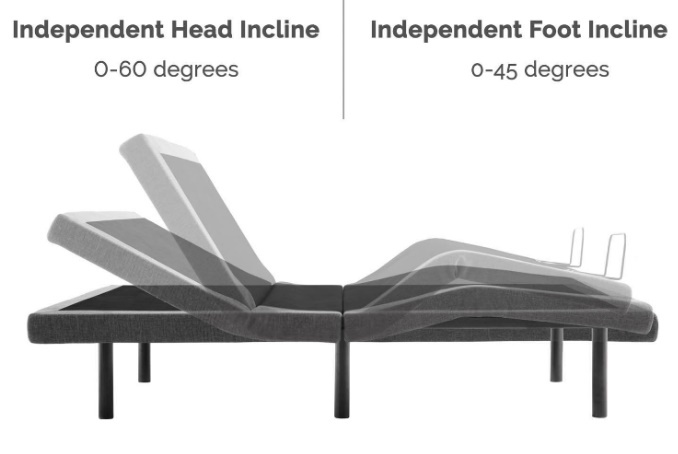 It has tapped an unexplored feature in low-end adjustable bed segment and this is surely a unique selling point that places Lucid far ahead of other brands and makes it a preferred choice in low end segment. The height of Lucid bed is fixed at 15 inches from the ground. It does not offer additional lengths for height adjustability which otherwise is mostly a feature made available only by high-end adjustable beds. In case of adjustable beds, anything between 13 inches and 15 inches from the ground is considered as an ideal height for both short as well as tall people. This space can also be effectively utilized for storage purpose. Additionally, as Lucid L300 comes with a wireless remote, you need not worry about wires tangling with your belongings stored under the bed. Like all basic adjustable beds, Lucid also offers retention bars at foot level. These retainers hold the mattress perfectly in its place avoiding the mattress from slipping downwards or sideways while performing both head and foot adjustments. The motor is ultra quiet and does not produce any annoying noise. It has exceptional lift capacity of 750 lbs which is the highest and on par with high-end adjustable beds. Even while lifting the head and foot sections, the lift pistons are extremely smooth, slow & sturdy and help you achieve your favorite position to a very precise level of accuracy. This is the very area where Lucid L300 leaves behind all other adjustable beds in the market. It is relatively simple, easy and less time consuming to assemble the entire frame together. Assembly takes less than 5 minutes. Open the frame upside down and you will quickly notice that the motor and the lift pistons come readily attached. All you have got to do is just fix the legs in their respective places. Attach the power cord to the power supply box beneath the frame, turn the bed on its legs and your Lucid L300 adjustable bed is ready for use. Additionally, Lucid L300 also offers power backup feature as well which is in fact an advanced feature. Just insert two 9 volt batteries in the power supply box and you can get your bed back to flat position even in case of a power outage. Lucid L300 adjustable bed base comes with 10 Year warranty. Lucid, which was primarily into mattress industry, is a new player in adjustable beds segment. 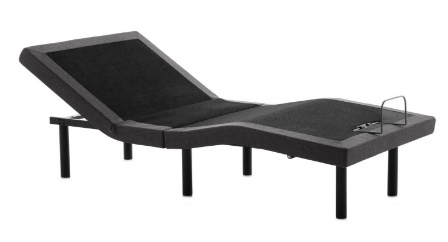 However, Lucid has taken tremendous advantage by analyzing wide range of basic adjustable beds. The company has embedded several advanced features into its basic model thus leaving behind all other low-end adjustable beds that were in the market for a long time now. For example, almost all basic adjustable beds come with only wired remote control. But Lucid has come up with wireless remote control. While no other low-end adjustable bed offers memory savable position. Lucid L300 offers 1 memory savable position. Similarly, other basic adjustable beds do not offer even a single USB port. This is the where, Lucid has left behind its contemporaries by offering total 4 USB ports. The power backup feature for the bed to get back to flat position in case of a power failure is an advanced feature offered by only high-end adjustable beds. But Lucid has provided two 9-volt battery slots in its power supply box that help the mattress to return to flat position in case of a power outage. Keeping in mind all the above advanced features embedded in a basic adjustable bed has what made Lucid L300 adjustable bed to catch up with all other leading sellers in a very short span of time. It’s price is its unique selling point.